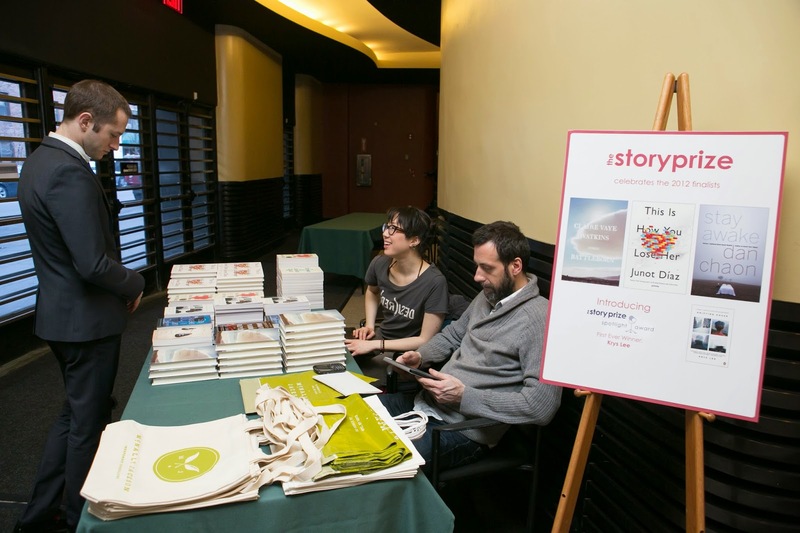 In case you missed The Story Prize event on March 5 at The New School, here's the video. That night, the three finalists—Andrea Barrett, Rebecca Lee, and George Saunders—read from and discussed their work on-stage. And at the culmination of the event, we announced the winner for books published in 2013: George Saunders' Tenth of December. When the three judges for The Story Prize make their choices, they provide citations for the books. This year's judges were Stephen Enniss, Antonya Nelson, and Rob Spillman. We include the citations in congratulatory letters we present to each finalist, along with their checks ($20,000 to the winner, $5,000 to the other two finalists). To protect the confidentiality of the judges' votes and the integrity of the process, we don't attribute citations to any particular judge. "This is a masterful short story collection. Full of formal innovations whose purpose is to illuminate character in new ways, these stories reveal the darkest parts of humanity while simultaneously giving us light and hope. They read like an indictment of our current condition but also as a timeless reflection on morality in a frequently unmoral world. The shifts in tone and point of view, sometimes within the same story, are dazzling. Craft, vision, and heart come together in an alchemical reaction creating a work of art that is much greater than the sum of its parts. At turns beautiful and heartbreaking, Tenth of December is destined to be a work of art that defines our times." "George Saunders offers, in Tenth of December, a vision and version of our world that takes into account the serious menace all around us without denying the absurd pleasures that punctuate life. This book is very funny and very sad. Its author is generous and wise, and his voice, in bringing us The News, is utterly, charmingly, wonderfully unique." To say that George Saunders' work has been widely celebrated, is something of an understatement. He has been a fellow of both the McArthur and Guggenheim variety. 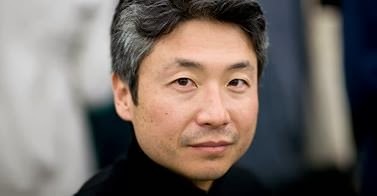 He has won the PEN/Malamud Award for short fiction. His stories have appeared in The New Yorker and Harper's magazine and have been chosen for the annual O. Henry Awards and Best American Short Story collections numerous times. He has appeared on Charlie Rose, Late Night with David Letterman, and The Colbert Report. Magazine cover stories have been written about him, and he has had a best-selling book, which appeared on the The New York Times lists for 15 weeks and reached as high as no. 2 on the hardcover list (all for a short story collection!). Pretty heady stuff—especially considering that those are just some of the highlights. 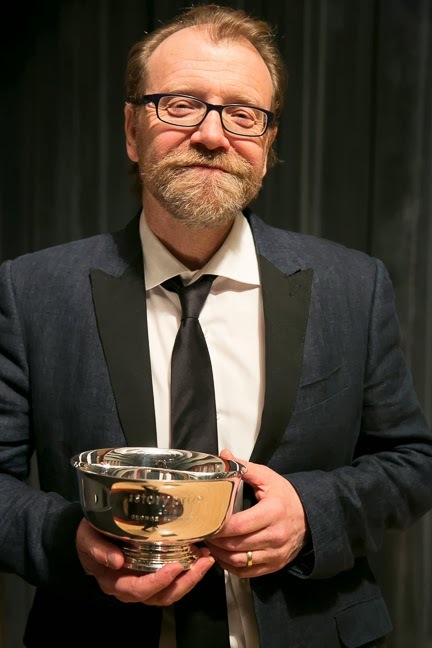 Still, one thing George Saunders had never accomplished—that is until last night—was winning a book award. Well, now he has. Saunders' story collection, Tenth of December, is this year's winner of The Story Prize. After he and fellow finalists Andrea Barrett and Rebecca Lee read from and discussed their work on stage at The New School in New York City, the Founder of The Story Prize, Julie Lindsey, announced Saunders as the winner, and he took the stage to accept the award. In the days ahead, here and on our Web site, we'll post more about this, including citations from the judges, photos (also on Instagram) from the event and the after party, video, and links to media coverage. The Story Prize event is tomorrow night (March 5) at 7:30 p.m. at The New School's auditorium at 66 West 12th Street. The three finalists, Andrea Barrett (Archangel), Rebecca Lee (Bobcat), and George Saunders (Tenth of December) will read from and discuss their work on-stage. At the end, we'll announce the winner. We hope you can join us. The evening aims, most of all, to be a celebration of these three authors, their incredible books, and, more broadly, short story collections. We're pleased to have one of the top independent booksellers around, McNally Jackson, selling signed copies at the event. And McNally Jackson is making it especially easy for anyone there—and those who can't be—to get copies. Let's say you're at the event and want to buy signed copies of the books, but you don't want to lug them around all night (or are prone to accidentally leaving things behind, like some of us are). No problem: McNally Jackson will provide free shipping for anyone who buys three or more books. You walk out empty handed (or no more burdened than you were when you arrived), and the books show up later at your house. Let's say a book is sold out, and you want a copy. McNally Jackson will follow up by shipping it after the event. Let's say you can't make the event and still would like signed copies of Archangel, Bobcat, or Tenth of December. For one month after the event, McNally Jackson will ship signed copies of the three finalists' books for free (while supplies last) when ordered from their Web site. All you need to do to get free shipping is to type into the comment box at checkout: Free Shipping-The Story Prize. We're very pleased that McNally Jackson is the official bookseller of The Story Prize. And last year, bookseller-in-chief Sarah McNally served as one of our judges. Our ultimate aim is to get more short story collections into readers' hands, particularly those of our finalists. Hats off to our bookseller for making it easier to buy these books—and, we hope, a little harder not to. My bag is heavy. Such lovely books, some as small as a postcard, others the size of a newspaper, with haunting covers in matte and gloss and simple paper, beckoning you to touch, smell the ink, read the words inside. The Saturday afternoon mob at the bookfair is a polite mob, a literary mob. There is little malice here, just the frenzied feeding on free swag. The magazines and presses are giving away their wares so they don’t have to lug it all home, if not for free then severely discounted. And even though you know you can’t fit another thing into your suitcase, it’s hard to pass up the new issue of Mid-American Review. Not just books. There are magnets, notepads, postcards, pins, screen cleaners, oranges, candy, T-shirts, bags, broadsides, and fortune cookies. Rumors circulate: So-and-so has the best chocolate (Omnidawn by unofficial consensus). There is a table offering a shot of whiskey (I search in vain, going up and down the aisles; with 650 exhibitors, it can be hard to find what you’re looking for, especially if you don’t have the name of a journal and you’re afraid to ask, "Where is the free whiskey?"). 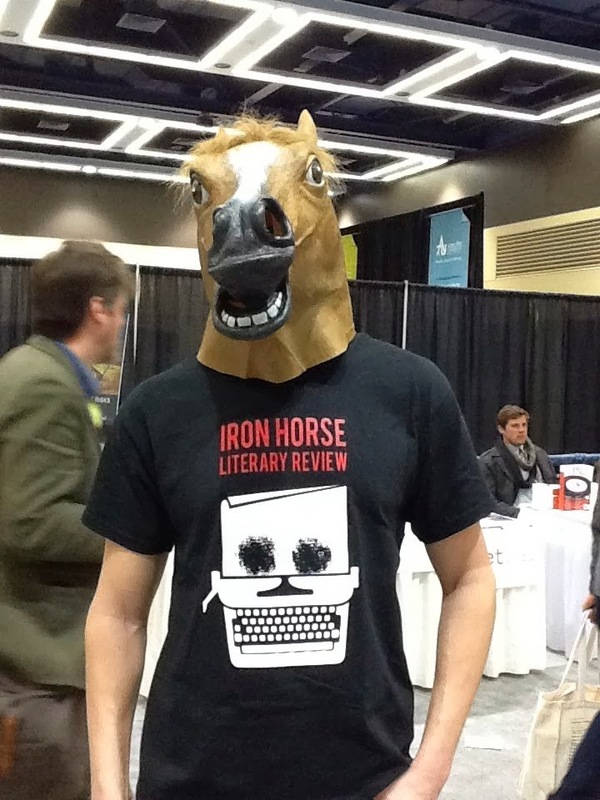 At Iron Horse Review, you can take your picture with someone wearing a rubber horse head. The bookfair is the big crooked beating heart at the center of AWP, and as I watch the interns carefully pack all their books and magazines and key chains into boxes, chocolate foils crinkled on the carpet at their feet, I feel sad this is all coming to a close, and so very grateful for these literary pioneers and architects. An editor gave me a bottle of wine she couldn’t fit, and, even though I had no room in my bag, I accepted it with pleasure—it was the least I could do.